It has been a tumultuous off-season for the World Series Champion St. Louis Cardinals, as they lost their face of the franchise first baseman, their iconic manager, and a couple of key front office members. However, life goes on, and it is time for the Cards to focus on the players they do have on their roster. One of those players is catcher Yadier Molina, who, after having his team option picked up, is in the last year of his current contract. From a PR perspective, letting Molina walk – and essentially losing their top two homegrown players in consecutive off-seasons – would be a disaster, but does re-signing the 29-year-old backstop to a lucrative deal make sense for the Cardinals? Molina has always been known for his defense, as scouts rave about his prowess behind the dish. This is supported by the fact that he has nabbed 44% of potential base stealers in his career, and over the last four seasons has been worth 15.9 fielding runs. Miguel Olivo, at 10.0, is the only other catcher in double digits. There is still a lot of work to be done on catcher metrics, but in this case the stats match the eyes. Although known mainly for his contributions behind the plate, Molina has also stepped up his offensive game. After posting wRC+ marks of 69 and 52 in his first two full seasons, Molina has been over 84 each of the last five seasons, including a career-high 123 in 2011. This was fueled by an ISO of .160, which is 54 points better than his previous high. While it’s not impossible for a player to find his power stroke at age 29, 2011 was most likely an outlier in terms of power production. After reading the above paragraph, one would believe that we are talking about a very good player, and of course we are. Over the last five seasons, only five catchers have more WAR than Molina’s 14.7, and two of them have very weak defensive reputations (Mike Napoli, Victor Martinez). However, the fact that he is a catcher was not getting its proper due. It has long been the industry belief that catchers break down earlier than other players due to the rigors of the position. This has generally prevented catchers from receiving lucrative long-term deals, and it doesn’t help that Joe Mauer’s eight-year extension is currently blowing up in Minnesota’s face. On the other hand, we all know that industry beliefs don’t always turn out to be correct. I asked the wonderful Jeff Zimmerman to put together some aging curves on catchers to see if the Cardinals would be taking on more risk due to the fact that Molina is a catcher. The results may be a little surprising. The blue curve is the aging curve for all players, which is self-explanatory. The red curve consists of 70 players since 1981 that I identified who spent significant time as a full-time catchers. The criteria used was at least four seasons with minimum 800 innings caught (lower in strike seasons). To put that number in perspective, 18 players caught 800 innings last season. The criteria for the yellow curve is a little more lenient – it consists of players who spent at least one season as a part-time catcher since 1981. One season of 200 innings caught will get a player into the sample. The samples were cut off after 30 years because they had enough data points to create a curve, and given advances in medicine, nutrition and training, it is more helpful to compare players to their contemporaries. 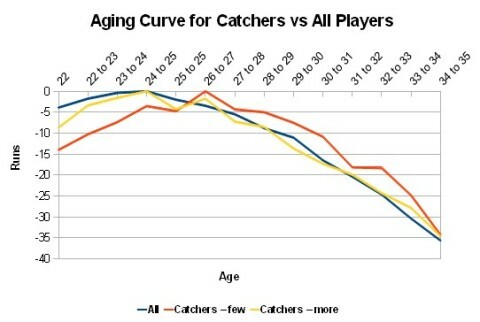 As can be seen from the graph, the general catcher population ages in a very similar fashion to the all players sample. This is partially due to the fact that this sample contains players who moved off catcher very early in their careers like Brandon Inge, Todd Zeile, and Craig Biggio. 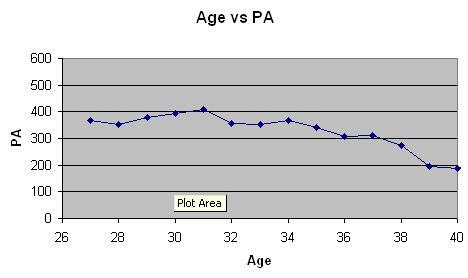 While aging curves aren’t perfect, it would appear that the concern over catchers falling apart at a young age is somewhat overblown. It certainly appears reasonable that teams can preserve a catcher by properly managing his innings behind the plate. The full-time catcher curve behaves a little differently. Catchers peak two seasons later than other players, which makes sense as many catchers are drafted for their defensive abilities. In the minor leagues, teams then work to develop this skill first, and then work on the bat. It doesn’t matter how good the bat is: if a guy can’t catch, he can’t catch. After this late peak, full-time catchers lose production at essentially the same rate as other players. In this sample, it is worth mentioning that some of the players did not catch during their decline phase. For example, B.J. Surhoff was done as a catcher at age 27, but continued playing other positions until age 40. However, they are few and far between, and the majority of the players in the sample are guys like Ivan Rodriguez, Mike Matheny, and Paul Lo Duca, who were catchers until the bitter end. Another thing that bears mentioning is that on the curve, runs are scaled to production per 600 PA. This means the curve does not account for playing time. To examine this, I looked at my sample of 70 catchers to see if there were any major reductions in playing time. There is a slight decrease from age 31 to 32, but other than that, nothing we wouldn’t generally expect from an older player at another position. Another potential issue when using aging curves is survivor bias. However, that is not so much an issue here as we want to compare Molina directly to others like him – players who were good enough to last in the big leagues for an extended period of time. Obviously, not all players fall in line on a simple curve, and Molina already bucks the trend, as he appears to be peaking a little later than usual. It is also worth mentioning that he has two older brothers who have caught in the Major Leagues for extended periods. Bengie Molina and Jose Molina both played at an acceptable level into their mid-30s, and Yadier has the most athletic body of the three. So, what does this mean for a potential contract extension? The most common number thrown around is $10MM per season over three or four years, which certainly seems reasonable given the fact that Molina would be 30 years old at the start of his next deal. However, given that catchers may not decline as quickly as the industry generally believes, the Cardinals could be getting a steal. The main issue is where one defines Molina’s true talent level. Last seasons 4.1 WAR is probably an aberration, but if you define Molina’s 2013 talent level at 3.5 WAR, he is worth almost $60MM over the next four seasons. If you are more pessimistic at have him at 2.5 WAR, he is still worth $38MM over four years and $32MM over three years. Another thing to consider is that defensive metrics may be underestimating his actual contributions. Research has been done that suggests framing alone can be worth a couple wins per seasons. An example: Over 2100 combined games, current metrics say that the defensive difference between Molina and Victor Martinez is seven wins. That number could easily be much higher. While the Mauer contract understandably makes GMs around the league nervous, it is important not to let one bad apple spoil the whole batch. Over the last 30 years, catchers have aged in a similar fashion to other players, and expecting Molina to fall off at age 32 just because he is a catcher is not the right way to look at the situation. Given these curves and the performance of his brothers, extending Molina looks like a smart move, both in terms of PR and winning ball games, if he is indeed willing to accept a figure in the $10MM range for three or four years. He has already stated that he isn’t willing to take a hometown discount, but maybe the Cardinals will be able to exploit a catcher discount. We hoped you liked reading Yadier Molina’s Potential Payday and Catcher Aging by Ryan Campbell! Matt Moore Unleashed: What Should We Expect? Well done piece. The framing argument is a good one. Also, need to consider the effect he has in handling a pitching staff. Do we have something in existence that weighs that? I just wonder if other bidders are going to pay market value for his defense. The Cardinals could be bidding against themselves for a catcher with a 700 career OPS. Also, I’m pretty sure Jose Molina is more athletic (tallest midget, I know). What would you pay for ozzie smith in his prime? Who had a sub 700 career ops? Matt – there is nothing I know of on that topic that I would trust to use in my analysis, but I am sure there are smarter people than me working diligently to figure it out.